Myrtle Jane Comer was born July 20, 1930 in Maloy, Iowa to Rolla Bryan and Florence Marjorie (Smith) Comer. She graduated from Maloy High School in 1948. Later she got her teaching certificate from Maryville. After she received her certificate, she taught school at country schools, was the librarian at Diagonal School and substitute taught at several surrounding schools through the years. On December 23, 1951 she was united in marriage to John Carl Cook. They settled on a farm near Diagonal where Myrtle was a homemaker and helped John on the farm. Myrtle loved quilting, embroidery, and crochet. All of her children, grandchildren, and some of the greats have handmade quilts lovingly made by Myrtle. Myrtle was a member of the Friendly Neighbors Club and participated in their quilting sessions and card parties. She always had an extra quilt on hand to offer for a family in need. She was a good seamstress and made many of her children's clothes--even prom dresses._She guided her daughters in their quilt and sewing projects for 4-H for many years. Myrtle never claimed to enjoy cooking but there was not a school function that was not graced with home made raised doughnuts fried in lard and coated in sugar glaze. They were the best. She also made wonderful chocolate cakes with fudge frosting, as well as many pies and cookies. She made pounds of fudge and divinity at Christmas time and gave most of it away. No one ever left her table hungry. The kids all had friends over and they were all welcomed. Then there were the pheasant hunters and deer hunters who enjoyed her ham and beans, chili, and vegetable stew. There were cakes and pies and sandwiches for snacks in the afternoon or when anyone stopped by for a visit. She canned and froze many quarts of vegetables, fruits, and chickens--nothing ever went to waste. Myrtle loved music and supported her musical children through the Band Boosters. Later in life she enjoyed attending music jams and of course Lawrence Welk on the tv. She was also an avid reader and read everything from history, biography, and romance. She always had a book by her chair. 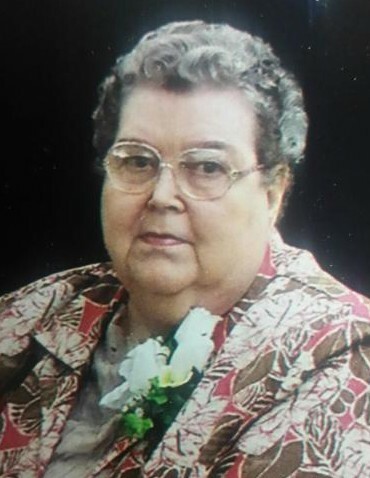 Myrtle passed away Thursday, April 4, 2019 at the Creston Specialty Care Center. Left to cherish her memory are her three sons John (Shelly) Cook of Creston, Bryan (Darlene) Cook of Diagonal and Dale Cook of Shannon City; three daughters SuAnn Cook of Diagonal, Teresa (Roger) Craft of Creston and Melody (Jeff) Beebe of Brookeville, Indiana; brother Bryan Merl (Marge) Comer of Mount Ayr; sister Shirley (Lee) Brand of Mount Ayr; eleven grandchildren; twelve great-grandchildren; many nieces and nephews and extended family. She was preceded in death by her parents; husband John in 1992; sisters Ethel Akers, Margaret Browns; brothers Allen “Bud” Comer and Rolla Ray Comer in infancy.